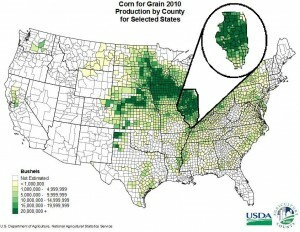 Illinois corn production for 2010. Let’s look at the statistics. Based on the Annual Survey of Manufacturers released by the US Census Bureau, Illinois ranked fourth in the nation in terms of manufacturing productivity in 2009. Manufacturing productivity is measured in terms of the total number of worker hours expended in a year, and Illinois racked up roughly 734 million in that year. So Illinois is a top agricultural source and a top manufacturer. But what are all those manufacturing hours being spent on? Is the value of that that labor reflected in terms of Illinois’s gross state product? According to that same Census Bureau survey, the total value of manufacturing shipments in 2009 amounted to just over $216 million, which accounted for around 34% of the state’s GSP for that year. Illinois has consistently ranked in the top five in terms of nationwide GSP – most recently it was ranked 5th. So if Illinois is such a manufacturing powerhouse, why don’t we hear more about it as such? This may be because Illinois has done and is doing what manufacturers seem to do best, which is to quietly and inconspicuously contribute to state and national economies in very significant ways. The current conversations that permeate Illinois industry seem to pertain primarily to questions and uncertainties about regulations and the costs of doing business. Of particular concern to manufacturers was the rising cost of workers’ compensation, uncertainty related to government regulation (particularly those regulations related to environmental protection) and business taxes. Despite these issues, in a recent survey cited by Crain Publishing’s Chicago Business magazine, 52% of 100 manufacturers in a survey reported that their businesses were either thriving or at least growing, which is compared to 44% of surveyed manufacturers nationwide. Of this 52%, more than half of them reported that they planned to increase inventories and workforces. All of this data is despite that fact that Illinois was considered by a survey of 300 executives to be in the top three worst states to do business. Considering the overall good performance of Illinois manufacturers despite poor economic conditions and an unfavorable business climate, it stands to reason that the prospects for Illinois manufacturers can only be favorable, especially if responsible reforms to business regulatory structures are made that improve the business climate without threatening environmental resources or workplace safety. The knee-jerk impulse can be to gloss over the success and perseverance of Illinois’s manufacturing sector and to focus on general pessimism and bearishness. But there is no arguing with statistics. It can’t be argued that there are no improvements to be made to industry in Illinois, and the state’s future success in that sector is likely to depend on how well it adapts to shifts toward leanness, automation and environmental sustainability. However, take a casual look at industry’s track record in Illinois, and you’ll see plenty of reasons to be optimistic.  IQS Newsroom Featured Profile: Fairchild Industries, Inc.